We continue our series on invasive plant awareness with a few facts about the ever-present English ivy (Hedera helix). English ivy was first introduced to the U.S. by European immigrants for its ornamental appeal. It is an aggressive invader that threatens all vegetation levels of forested and open areas, growing along the ground as well as into the forest canopy. On the ground, English ivy forms dense and extensive monocultures that exclude native plants. English ivy also serves as a reservoir for Bacterial Leaf Scorch (Xylella fastidiosa), a plant pathogen that is harmful to elms, oaks, maples and other native plants. Looking for a climbing, evergreen vine to plant in your yard similar to English ivy? Opt for native Crossvine (Bigonia capreolata) instead. This cold-hardy, easy to grow vine attracts hummingbirds, butterflies, and has beautiful two-toned trumpet flowers. Nandina or Heavenly Bamboo (Nandina domestica) is such a common landscaping shrub, you could easily mistake it for a native plant. However, Nandina was brought to North America as an ornamental shrub from Eastern Asia in the 1800s. While the leaves of Nandina provide beautiful fall color and the bright red berries look great as festive centerpieces, the seeds are easily spread by birds and some evidence has shown that the berries could be toxic to birds such as the sleek, migratory cedar waxwing. 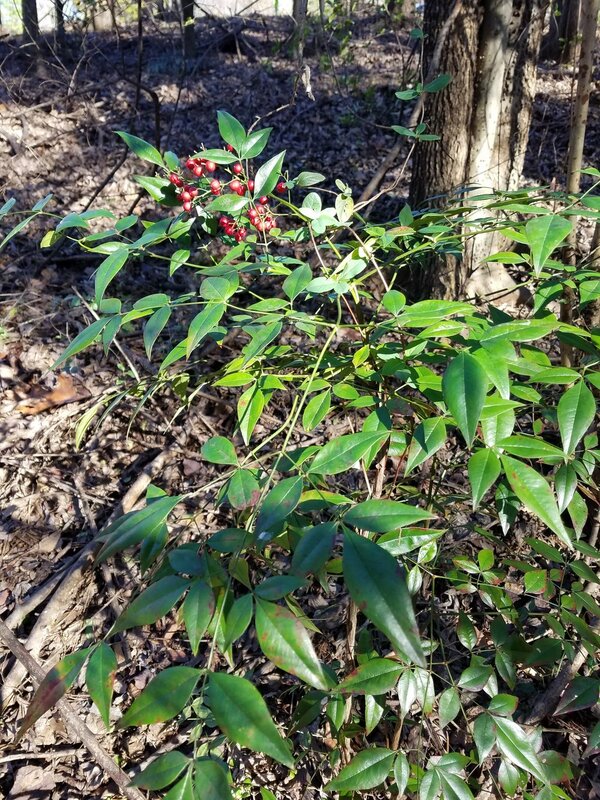 This shade tolerant shrub also invades forest edges and interiors which can displace surrounding native plants. If you are looking for plants with vibrant fall color, consider planting native species such as Alabama Croton (Croton alabamensis) or if you want a plant that stays green year round, try the evergreen blueberry (Vaccinium darrowii) which is also beneficial to native bees. As a reminder, we will have a variety of native species beneficial to wildlife at our annual Native Plant sale on April 6th and 7th! Older PostThank you to our members, for your help supporting the place that you love.